Building on the momentum of International Women's Day, companies recognized Equal Pay Day as a moment in time to call attention to the gender-pay gap – from providing 20 percent discounts to customers to donating up to $100,000 to fund wage negotiation workshops. Yet, one company went above and beyond a day-long celebration to bring awareness to this issue in a more lasting way. After the monumental success of their #OptOutside campaign, REI is again building a groundswell both inside and outside the company. After conducting research, REI found that 6 in 10 women say that men's interests in outdoor activities are taken more seriously than women's. In response, the company launched "Force of Nature," a multifaceted approach to encourage and equip women to pursue outdoor passions. Since 63 percent of women say they cannot think of an outdoor female role model, REI is putting women at the forefront of all its marketing content and will partner with Outside magazine to create the first-ever all-women's issue showcasing outdoor female role models. But the company isn't just changing their brand narrative. "Through ‘Force of Nature,' women will be front and center in our brand and storytelling spaces, but our commitment goes way beyond a ‘brand' discussion," says CEO Jerry Stritzke. The program also extends to the company's philanthropic and product innovation initiatives — REI will invest $1 million into nonprofits that get women and girls into the outdoors and is working with vendors to develop gear specifically for women. The outdoor gear company is also planning more than 1,000 women-centered events to take place on May 6. And the campaign uncovers a deeply embedded part of the REI brand and history: REI was founded by a both a man and a woman. "It's in our DNA," says Stritzke. "We believe that access to the outdoors is a right that should be available for all—men and women." The magic of "Force of Nature" comes from the surround-sound approach of execution, which touches on its media strategy and advertising, product innovation, philanthropic commitments and events. 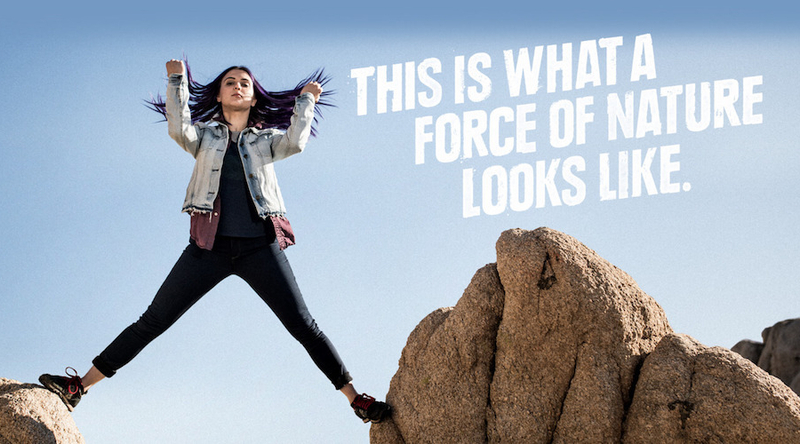 This all-encompassing campaign truly demonstrates REI's inherent company values and commitment to empowering women in the outdoor industry. In the days and months to come, we will see if a campaign of this scale may be grand enough to inspire others to act and create another movement. Walmart Announces Shared Women-Owned Business Spend Initiative with WBENC, Campbell Soup Company, The Coca-Cola Company, ExxonMobil, General Mills, Johnson & Johnson, Mondelēz International, PepsiCo and Procter & Gamble. Pepsi has apologized for a controversial advertisement that borrowed imagery from the Black Lives Matter movement. Airbnb is calling for marriage equality in its latest Australian campaign, first spotted on Ad News Australia, by asking people to wear a broken ring. Facebook and Mozilla are among the companies and organizations launching a $14 million fund to promote news literacy and increase trust in journalism. The space, designed for middle school students who don't have access to computer education at their own schools, wants to inspire kids to learn about the fun of technological problem solving, while they're still young. About a month and a half ago, the founders of B Lab — Andrew Kassoy, Bart Houlahan and Jay Coen Gilbert — published an open letter calling on all businesses to act as a force for good. The auto industry continues to look towards a sustainable future with the development of a new partnership between 10 of the world's biggest automakers. While others try shoes that lace themselves or have 3D printed soles, Reebok will have "plant-based" footwear on shelves this year. In his groundbreaking 1962 opus Capitalism and Freedom, economist Milton Friedman famously claimed that the "one social responsibility of business [is] to increase its profits so long as it stays within the rules of the game." 7-Eleven, Inc. will energize 425 stories in Texas with wind energy it will buy from TXU Energy. The Hershey Co. has announced new plans to take its transparency efforts to the next level, with the introduction of Sourcemap, an interactive pilot experience that provides consumers with a glimpse into the company's supply chain. In Australia, 6,000 kilograms of fashion waste is generated every ten minutes. That could be the sum of that too-small t-shirt that you bought from H&M last week, or that semi-alternate/hideous jumper you tracked down at Salvos (and never wore). For other products, such as plastic toys, recycling can pose a tricky question. After all, the types of plastics that are accepted into waste management streams vary by municipality. Golden Valley-based Mortenson has become a national leader in the construction of wind and solar energy projects. Nonprofits all have one thing in common: They need to raise money. There are some that do it better than others, and they're usually the ones who manage to make the biggest impact. Minneapolis-based GHR Foundation is upending conventions with its BridgeBuilder Challenge, which is offering $1 million annually for outside-the-box ideas. The F. B. Heron Foundation is an investor—a capital investor—in enterprises where we see opportunity for mutually productive social and financial gain. What's the most important thing nonprofits should know when it comes to embracing technology to advance their mission? Unsubscribe whitney.dailey@gmail.com from this list. Copyright (C) 2017 Cone All rights reserved.